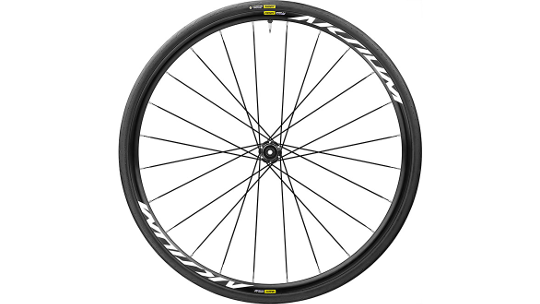 The Mavic Aksium's are a fantastic all-year-round training wheel that is highly reliable. 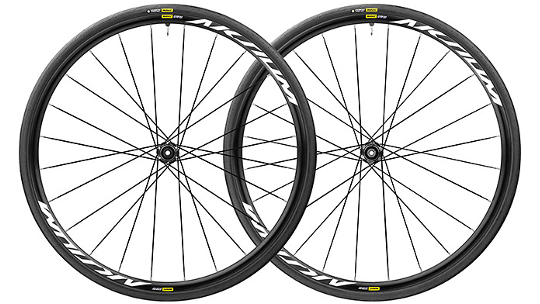 Mavic has added to the design of the Aksiums, now making them tubeless compatible. This means you can forget about the need for inner tubes, removing friction and lowering rolling resistance for a more consistent and comfortable ride. The tubless design, also known as UST, allows you to drop the tyre's overall pressure, meaning you reduce the risk of puncturing in bad weather conditions. The disc brake design is faster and highly more efficient in all weathers and on all road surfaces. Finally, the Aksium's welded rim not only reduces the wheelsets overall weight but adds durable strength that isn't going to falter in challenging riding conditions. Mavic's UST tubeless design increases rolling efficiency and reduces the risk of flats so you can spend more time riding your bike. The rim contour and diameter is optimised for ease of use with UST and tube-type tyres that are provided with the wheelset. Mavic has welded the rim which not only saves 40g of overall weight to the wheelset but also adds strength. Wider rim design improves rolling efficiency and comfort, allowing you to ride for longer with ease. Mavic's Yksion Pro UST tyres offer secure traction and puncture-resistance that ensures quality protection all year round. High-quality cartridge bearings perform consistently and are durable for testing winter training rides. Disc brakes deliver confident braking in variable road and weather conditions, so you aren't limited to sunny, summer rides.